It is most popular in the countries, Germany, United Kingdom, Canada, United States, China & Malaysia. Topics: Wow Gold, English, 日本語, and Rewards. The estimated 2,878 daily visitors, each view 4.50 pages on average. It is hosted by Amazon.com Inc (Washington, Seattle,) using iCache/1 web server. It has 5 nameservers, including dns1.name-services.com, dns2.name-services.com, and dns3.name-services.com. 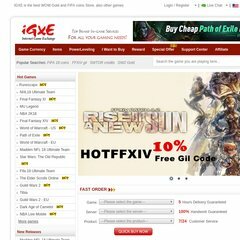 Igxe.com's IP address is 50.18.187.108. PING www. (50.18.187.108) 56(84) bytes of data. Website load time is 2214 milliseconds, less than 74% of other measured websites. As well, a ping to the server is timed at 43.6 ms.